Olson has been acting superintendent since September when Sandy Karsten was appointed as Director of the Department of Public Safety. Olson talked about the patrol’s decades-long history, but also cited his priorities for the future. “Closely examining the use of allocated resources, safety for all patrol employees, opportunities to improve public service, and strengthening diversity in recruiting for the agency will also receive my full attention,” Olson said. Olson also said the agency will continue to look at ways to improve its use of technology to combat crime. Parson said Olson’s varied law enforcement experiences in both urban and rural areas as a key reason for his appointment. Olson served as head of Troop A, which is based in Lee’s Summit and also led the patrol’s drug and crime control division. 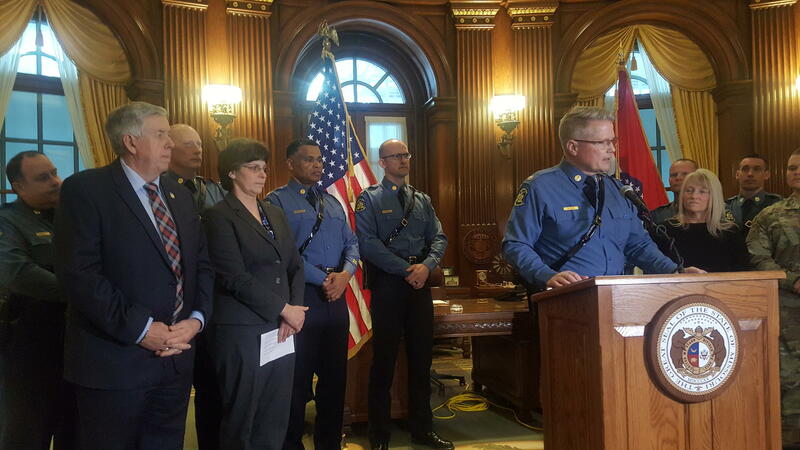 When asked if Olson would continue the special patrols on highways in the St. Louis region, which are aimed at helping free up resources for local police to fight crime, Parson said discussions are continuing. “We’re here to figure that out because we’ve got problems in some of the bigger metropolitan areas along with other parts of the state, we’ve just got to figure out how to do it better,” Parson said. Olson is a native of Chillicothe, MO and graduated from William Jewell College in Liberty.